3-4 good sized cloves of garlic smashed real good, and don’t worry about the paper—throw it in too. Mix all the ingredients except the oil, alcohol and meat in a ziplock bag until the sugar has dissolved. Taste it and note the balance of sweet, salt and sour for future reference. Add the oil and alcohol and mix well. The marinade is ready. If using large chicken breast, cut it in half across the plane so you have two “steaks” and pound them to 3/8 – 1/2 inch thickness. For smaller breast and boneless chicken thighs (which are probably the best and what they use in Thailand) just pound them down to 3/8 – 1/2 inch thickness. Marinade chicken for 1 – 2 hours. My favorite pork cut for this are country style ribs (actually pieces of pork shoulder) that I pound down to about a half inch thick. If I am using pork loin, I cut it across the plane (with the grain) about ¾ to 1 inch slices and pound it down to one half inch. Any cut will work, just cut in one inch pieces and pound to 1/2 inch. I wouldn’t use tenderloin. Marinade pork 2 – 3 hours. 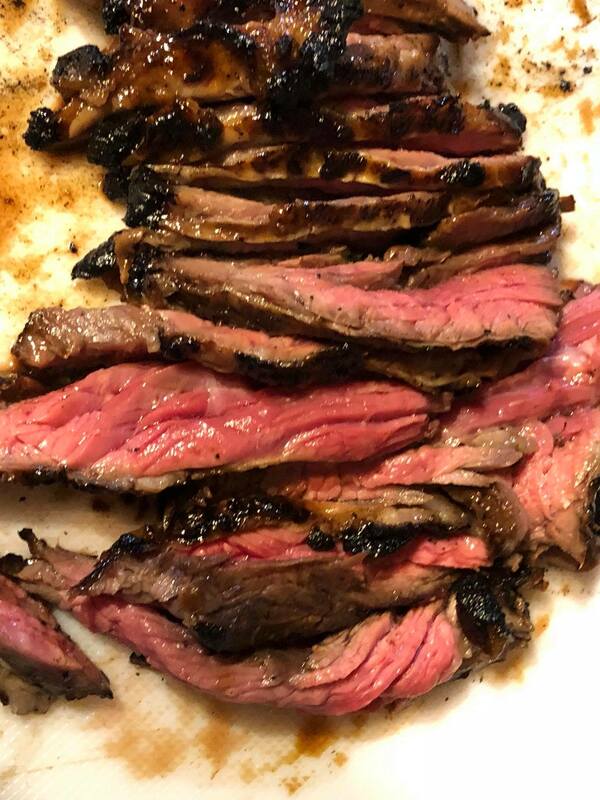 For beef, flank steak, skirt steak or hanger steak are perfect. No pounding. Just chuck it straight into the marinade for 2-4 hours. If you make this with these cuts, the dish becomes “Crying Tiger Steak” and not lemongrass beef. To grill, if you have a gas grill, fire up all burners as high as you can get and preheat covered for 30 minutes. For charcoal, get your coals going and when they’re ready don’t spread them all out. Make a pile about 4-5 coals high.Take your meat out of the marinade and straight to the hot grill. For pork, chicken and skirt steak, cook as hot and fast as you can flipping frequently and basting with canola oil each flip until done. You actually want flame up. For flank steak you’ll probably need less heat and cook it a little longer. Let the meat rest before slicing and serving with sticky rice and nam jim jeaw recipe here. Note on fish sauce. All my recipes are written using Tiparos brand fish sauce. This is important because salinity in different brands vary wildly. The other brand I use when I can’t find Tiparos is Squid brand (no squid in it). Squid brand is twice as salty as Tiparos. So if using that, I cut the fish sauce in half and add back the lost amount in water. For a different brand, check the sodium on the nutritional label and do some math. Tiparos is 740 mg per tablespoon. Do not buy a brand called “Tips”. This is a rip-off brand and I hear it’s disgusting. I don’t like most of the commercially available breakfast sausages all that much. I often find them a bit too salty and a bit too sagey. I remember how much I loved my uncles breakfast sausage after he would butcher a hog in the fall. I wondered if I couldn’t come up with something. I’ve made Italian sausage and Mexican chroizo before, I had sage in my pantry, why not? 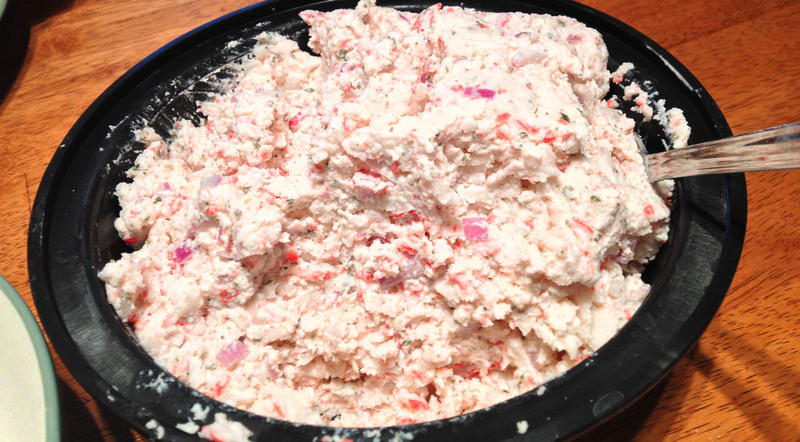 I started with several other peoples recipes–most notably Alton Brown. Some recipes added other herbs (rosemary, parsley and marjoram), some didn’t have added sugar, some used fresh herbs–I used dry. I then modified and tweaked my recipe until I found a formula I liked best. Not too salty. Not too sagey. No need for special equipment. Really simple and easy to make. I put all the ingredients except the pork into a bowl and mix them together well. Then I add the pork and try to incorporate the seasonings without mixing it top much. 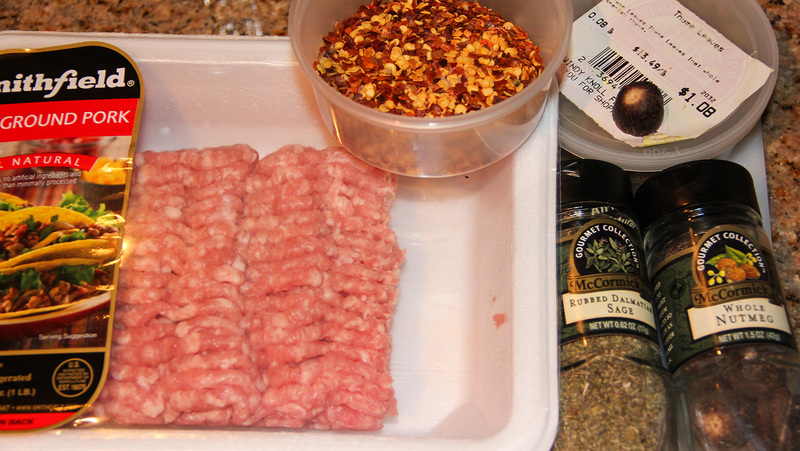 I just of just keep breaking apart the ground meat until all the seasonings are mixed in. Then you need to let it sit in the refrigerator for a couple hours (or overnight) for the flavorings to be drawn into the meat. 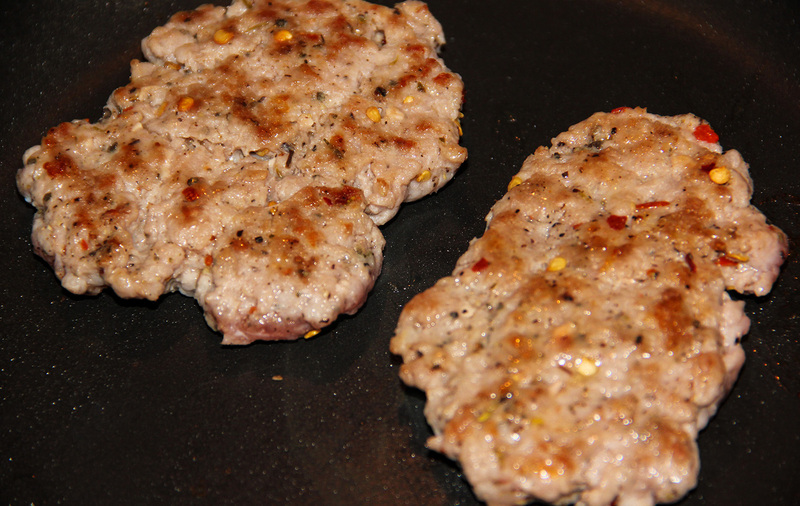 Then make patties or use it loose to make sausage gravy. 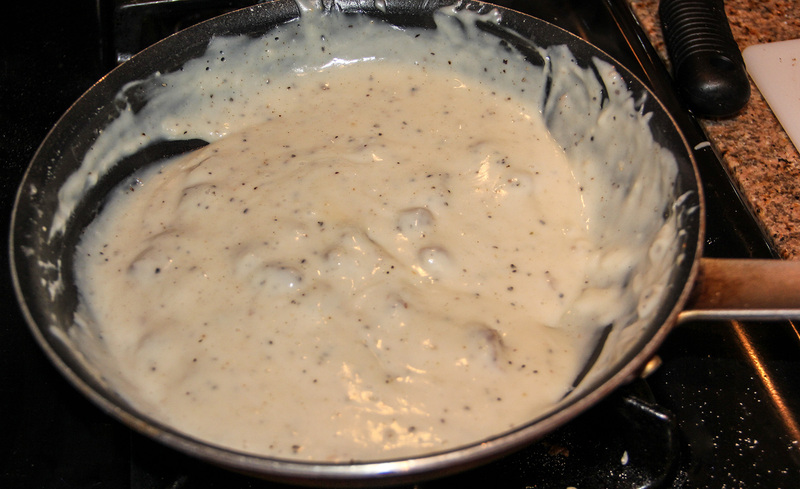 I know how to make proper, homemade sausage gravy. It’s not difficult. It does take some time with having to create a roux. If I am cooking for a lot of people, I just go ahead and make the regular milk gravy. But I love legitimate kitchen shortcuts and this is a good one. 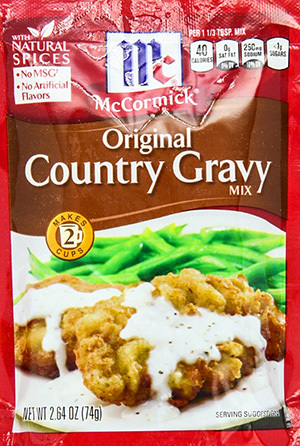 One day I happened to notice at the grocery store that the packet country gravy uses water and not milk. I bought a couple packets to try for those times I don’t have any milk and want sausage gravy. I started out by browning off about a half a pound of sausage. After removing the meat (leaving the fat and browned bits), dump 2 cups of water into the pan followed whisking in the gravy powder until smooth. Bring back to a boil and cook for one minute. Stir the browned sausage back into the gravy and you’re done. Even though biscuits are traditional, I often eat this gravy over toast. 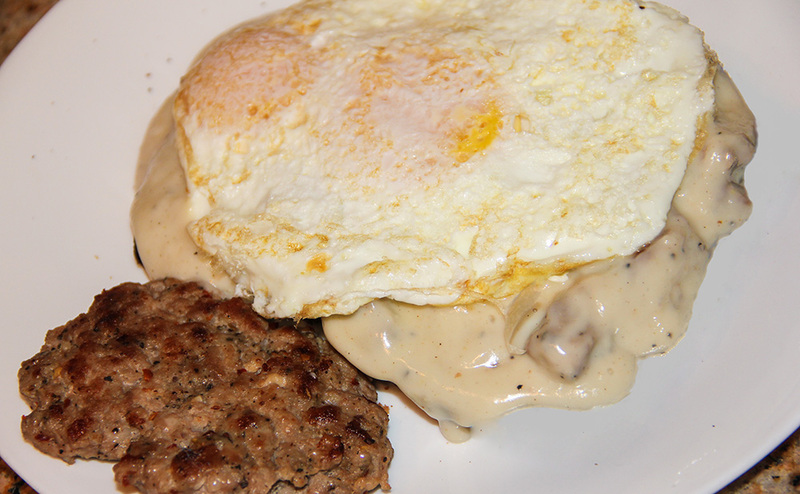 My favorite is to fry up a couple of patties for the side and a couple of eggs to go right on top of the biscuits (or toast) and gravy. Fuji is a chain of Japanese style restaurants ubiquitous in Thailand. I am not sure how authentic the Japanese food is, but I love this restaurant. Click here to see their menu. When Nok (rhymes with Coke) and I go there, she always orders their spicy tuna salad. Just last week I was in Thailand and as we were eating at Fuji, Nok mentioned that Noi (rhymes with boy) knows how to make the tuna salad. I asked Nok to get Noi to send the recipe in Thai and I would translate it (yes, I read Thai), make it and post it on my recipe site. This is the fruit of that labor. 1 can of chunk tuna fish (albacore is good for this one), drained. Noi’s recipe called for one packed in oil, but I made it using the spring water variety. Lettuce, about a quarter to a third of a medium head of iceberg, chopped or ripped into bite-sized pieces. Fuji uses iceberg, I used green leaf and iceberg, but I think you can use any salad greens or mixture of greens you like. Cherry or grape tomatoes, 1/2 cup, halved. 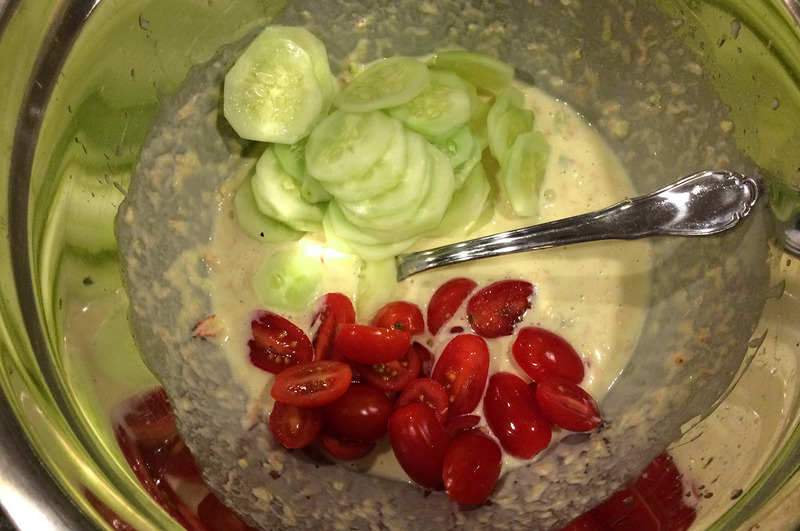 Japanese or Asian cucumbers, 1/2 cup, thinly sliced. You could probably use any type of cucumber. The Asian ones are smaller, both in length and girth, than the typical American ones. They also have less water and a smaller seed to meat ratio. If you are using the American variety, you should slice them thin and then half them into semicircles. Lemongrass, about a tablespoon or two, very, very thinly sliced. As thin as you can possibly get it. Mandolin slicers work really well for this. Thai mouse poop chilies, one tablespoon or two (I use 2). You can use any small chili peppers you can get. At the Asian market near me, they just call these “Thai chilies”. 1 small lime. Use the Asian variety if you can find them. A key lime is basically the Asian variety (I think). If you can’t find Asian limes, you probably only need half of the larger “regular” ones. Mayonnaise, about a 1/4 cup. 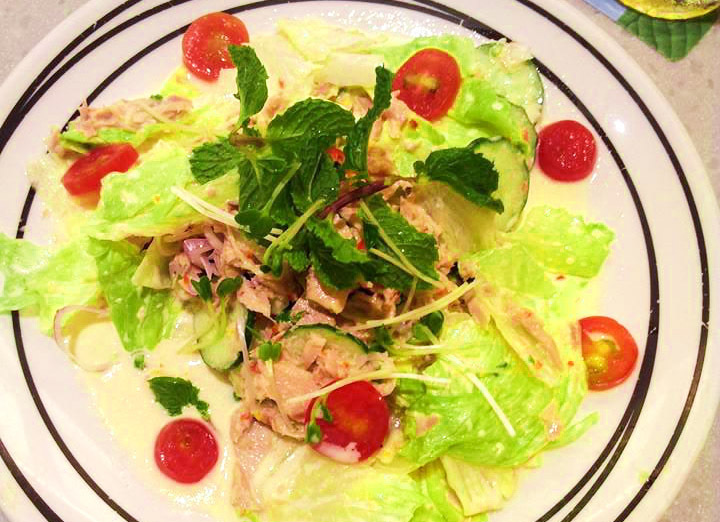 Kewpie variety might be traditional in Japan, but Noi used Thai salad cream, which is very sweet. I think any mayonnaise you like will work, but it will change the flavor a little bit. Daikon radish sprouts, about 1 tablespoon. This is sort of optional. I found them at my local H-Mart. But it was $2.50 for a small container so I didn’t bother. I don’t think you need to substitute something for it either. 1-3 teaspoons of sugar–I go 3 teaspoons which also equals a tablespoon. 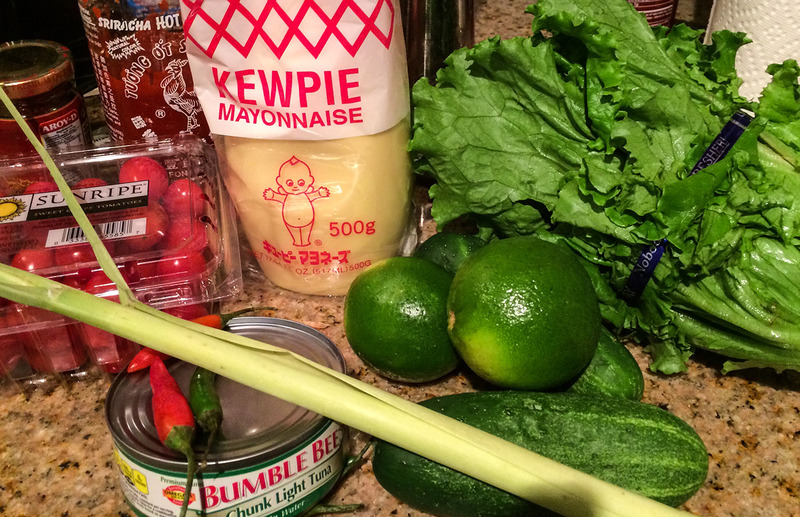 Noi’s recipe did not call for sugar, but she used the Thai-style sweet salad cream. I used Kewpie and needed to add the sugar. In a bowl, add the mayonnaise, lime juice, 1/2 teaspoon salt and sugar and mix well. Taste it now. It should be a little sour, a tiny bit sweet and salty enough to season the rest of the ingredients. Adjust seasoning as needed before going to the next step. 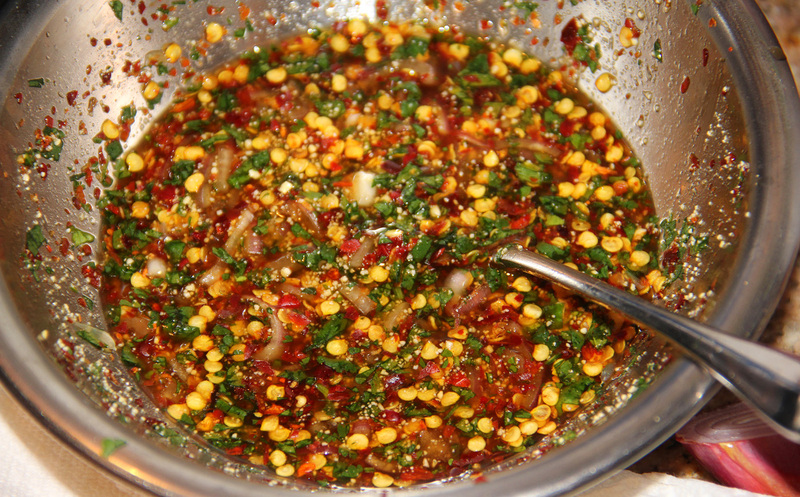 Now add 2/3 of the chili, the lemongrass plus the tuna and mix gently. 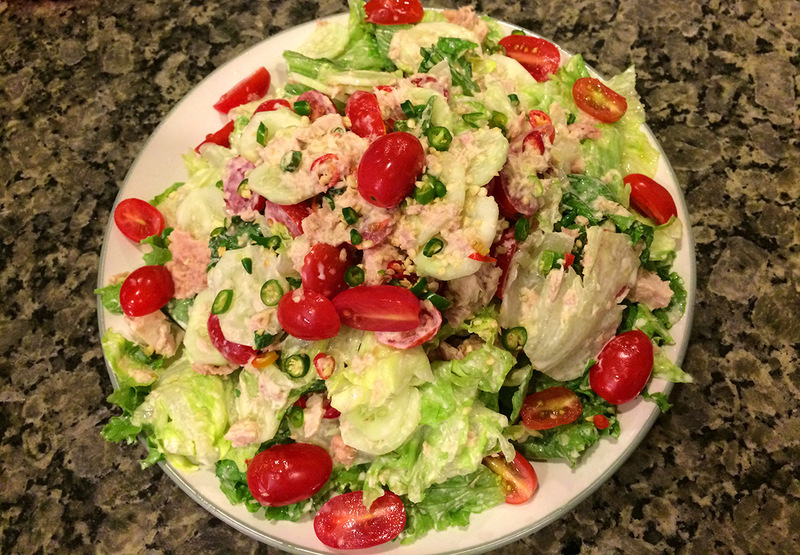 You don’t want the tuna to be completely broken down–should have some chunk left in it. Next add cucumbers, lettuce and 2/3 of the tomatoes. Toss gently to coat. Put the salad on a plate. Sprinkle with the remaining 1/3 of chilies and tomatoes, then the daikon radish sprouts. Garnish with mint leaves. That’s it! This is part 2 of a four part series that should have been posted 4 months ago. New job and a month in Thailand has me neglecting my blog. BTW, this is now going to be a 5 part series as I’ve worked out my version of nam jim jaew with tamarind, where as the first version is lime. This post is about Southeast Asian sticky rice. This should not be confused with Japanese or Korean sticky rice. 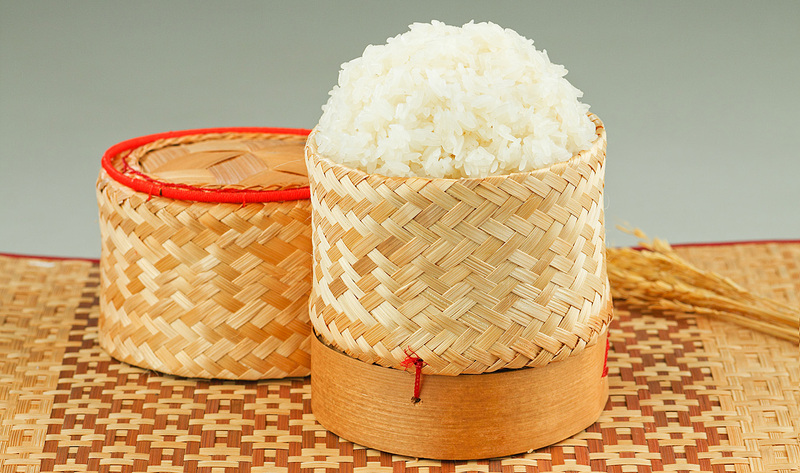 Those rices use a more traditional rice with a soaking stage that produces a stickier rice rather than fluffy one. 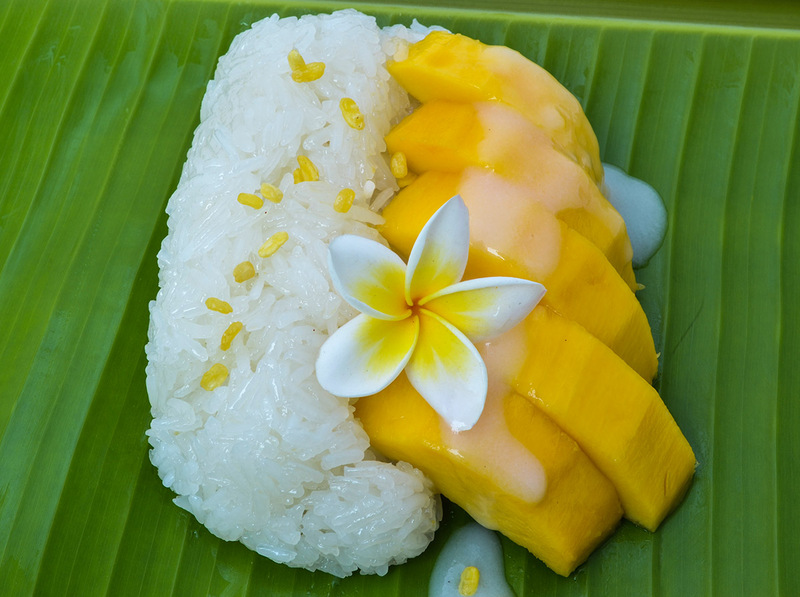 Southeast Asian sticky rice is also used in Japan, China and Korea but they call it “sweet rice”, (I think) generally because it’s mainly used for desserts/sweet dishes. In Thailand, particularly in the North and Northeast regions, this is the main staple rice, not jasmine rice, and is served with savory dishes. I will be posting my Thai grilled pork (หมูย่าง) recipe soon. That goes great with sticky rice! The Thais use it for desserts too. Ever had mango like the picture above? That’s this kind of rice. This is how to make that sticky rice in a rather non-traditional manner. The traditional manner involves this picture to the right. I actually have one of those things. They work. It’s the classic. It’s also at my Mom’s house in Utah. An excellent Thai food blog is SheSimmers.Com. I highly recommend you check it out. It is so much better than mine–though I was happy (proud?) to find our recipes on several Thai dishes are very close. She had a post on how to make sticky rice without the traditional equipment using a splatter guard, a regular saute pan and a stainless steel bowl. It’s brilliant. That method can be found right here. I have an “Aroma Rice Cooker / Food Steamer”, just like above. 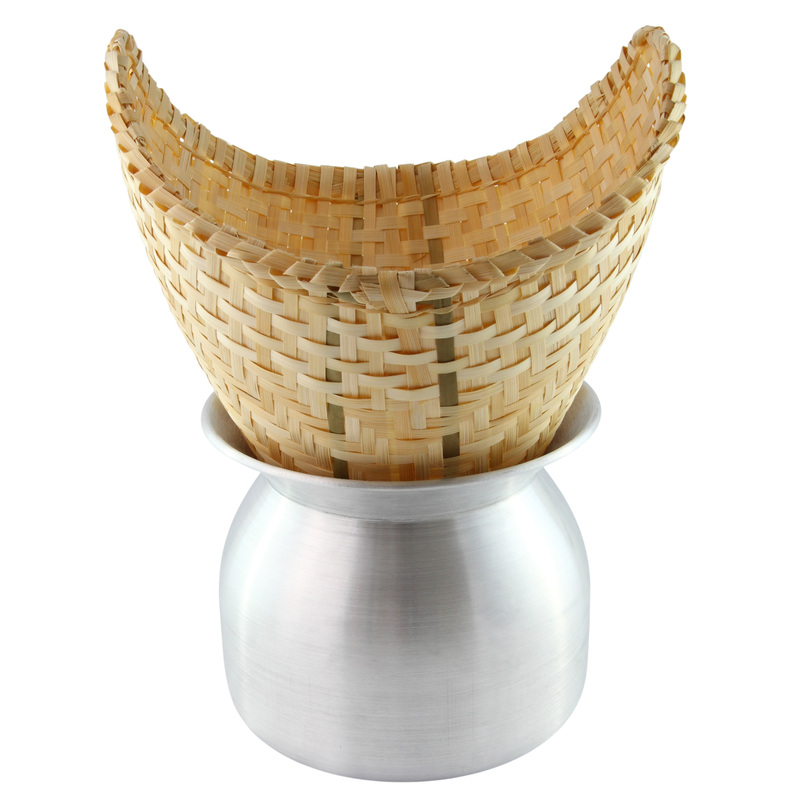 They include this steamer basket that sits above the rice as it cooks. I haven’t cooked meat in mine, but I have cooked vegetables there from time to time. Now I steam my sticky rice with it. Here’s how you do it. First you need to buy sticky rice. I’m going to say this again–you cannot make this kind of sticky rice with regular rice! 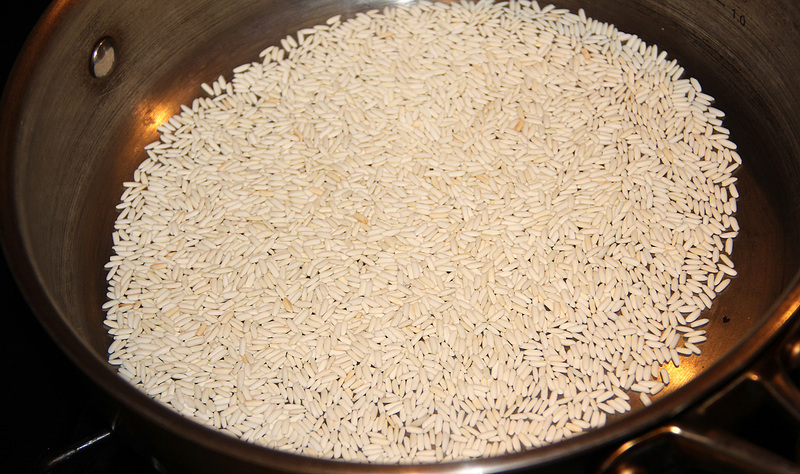 You need to rinse the rice just like you would for jasmine or other types of rice. What!? You don’t rinse your rice before you cook it? Stop that! Rinse all types of rice 3 to 4 times before cooking. The gets rid of dust, extra starch, rice bran powder leftover from when the hull was removed. Always, always, always rinse your rice. 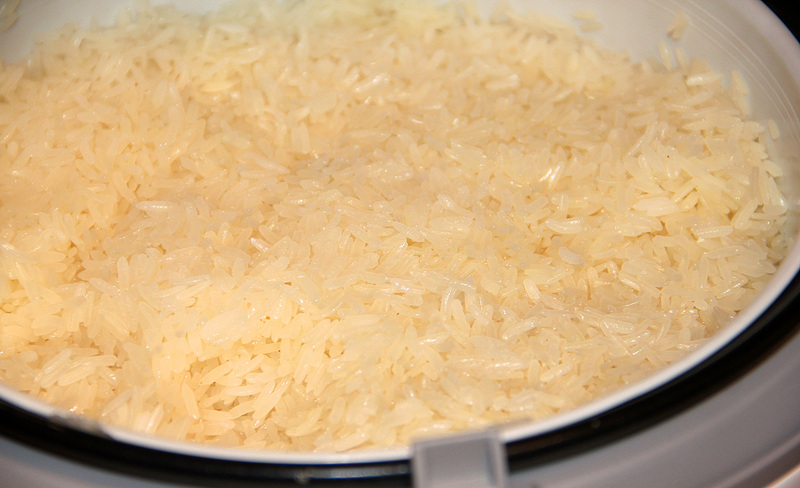 After rinsing, I put the rice in the main rice cooker part and cover with several inches of cold water. You should let it soak about 8 hours, give or take a couple. Sometimes I’ve let it soak for up to 12 hours with good results. If you do not have 8 hours, there is a cheat. Use the hottest tap water you can and let it soak 3-4 hours. It’s not quite as good that way, but it’s better than no sticky rice. After soaking, drain the rice and put it in a bowl–we’re going to get right back to it. Next, clean out the rice cooker pot and put in about 3 inches of water. Then put the steamer basket in place. You’ll notice the steamer basket has huge holes where the rice would fall right through. You gotta do something about that. You could use cheesecloth or muslin, but the first time I went to make this, I couldn’t find cheesecloth anywhere. When did Safeway stop carrying cheesecloth? I was considering using a clean kitchen towel but happened to notice my basket-style coffee filters on the counter. Eureka! When I flattened out the filter it fit perfectly into the steamer basket like it was designed to work that way. So down goes the coffee filter, in pours in the rice and I level it out. BTW, you can use cheesecloth. Just cover the basket with the cloth and leave enough to wrap around the entire thing. Then just close the lid and run a cycle. Mine goes for about 45 minutes which seems to cook it properly. About half way through I use a spatula to flip the rice over. I usually can only get about a quarter of the rice flipped each time and then I level it out again. Close the lid and let it finish steaming. If you use cheesecloth, the flip can be done all at once. 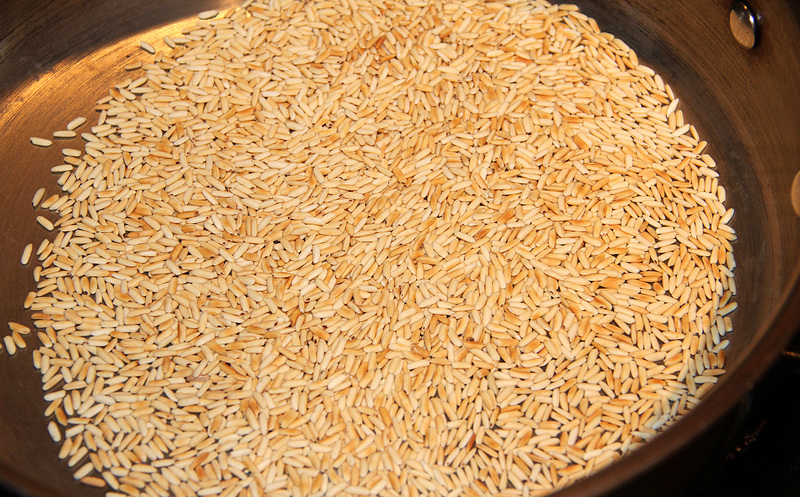 If after a cycle the rice is still not done, just run another cycle–but keep checking it. It won’t take 1.5 hours to steam. Check to make sure you haven’t run out of water too. If you have just add more. That is pretty much it. I usually turn off the cooker and scoop out a portion of the rice and then close the lid to keep it warm and moist. Sticky rice will get cold and hard very quickly, so I usually pull out only 5-10 minutes worth of eating and leave the rest inside. If your batch does become cold, just steam it for 5 minutes or so and it will bring it right back. 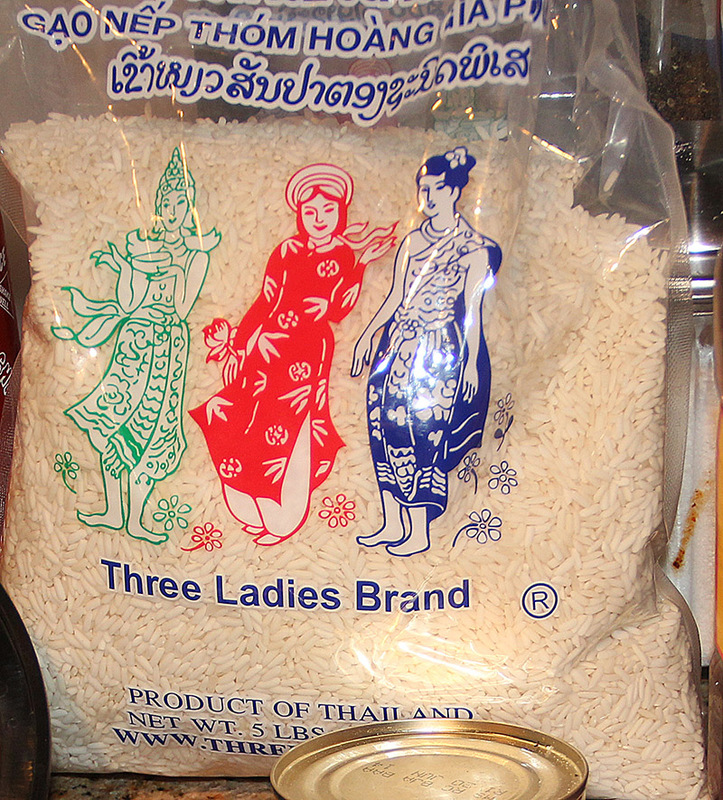 Toasted rice powder, khao kua, is an ingredient in several Thai dishes. Most notably, laab (ลาบ), yum nam tok (น้ำตก) and jaew (น้ำจิ้มแจ่ว) dipping sauces (my 1st jaew recipe is here). You can buy it already made in small jars like McCormick spices, but it’s kind of expensive and if you already have sticky rice, it’s easy to make. Start with a dry pan over medium heat (can be non-stick I guess, but I use my tri-clad) and put as much uncooked rice as you want to make powder. I usually cover the pan. This is more than I would use at one time, but the stuff stores well for several weeks. Then slowly dry roast it, like you might for spices, for the next 10-20 minutes. Keep shaking and pan-flipping every minute or so. Do not let it burn! Once it’s a nice brown color (and fragrant. Kind of reminds me of the smell of popcorn). Take it off the heat and allow to cool. Once cool, simply chuck it into a food processor or a coffee grinder and grind it until it’s little coarser than corn meal. Don’t take it all the way to a fine powder. And that’s it. Easy, easy, easy. Just takes a little time. 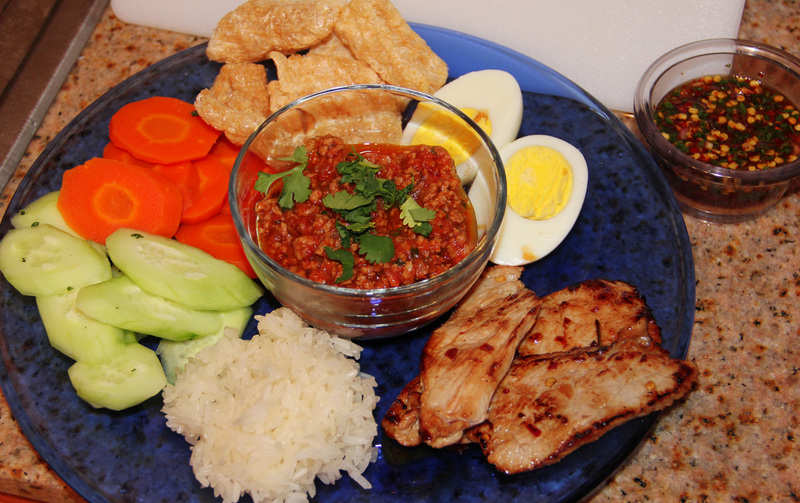 This is the first of a five part series on Northern and Northeastern Thai dishes. The other three will be “Moo Yang (Moo Yahng, Mu Yang or หมูย่าง), Nam Prik Ong น้ำพริกอ่อง, Nam Jim Jaew #2 (tamarind version) and one encompassing the two topics “How to make Thai sticky rice easily at home” and “How to make toasted rice power ข้าวคั่ว”. 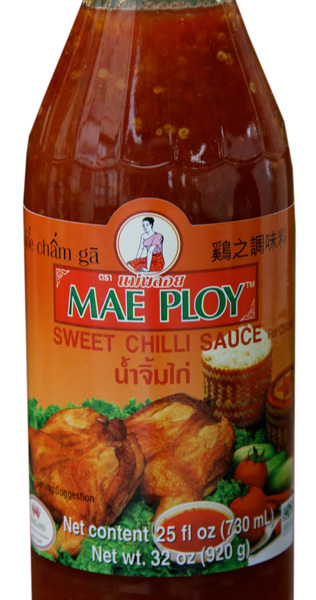 This sauce is one of my favorites from Thailand. Everyone probably knows the “Thai Sweet Chili Sauce” or nam jim gai, literally translates as “dipping sauce for chicken”, but nam jim jaew (sort of rhymes with cow) is almost as common. If you get grilled chicken in Thailand you will get both of these sauces every time. There are actually two different kinds (maybe more?) of jaew that I used to get. This is one of those types. The second type has tamarind in it and that’s a different show. I made this just yesterday to take to a buddy’s birthday party and I got several requests for the recipe. So here it is. Shallots, 1 “normal” sized bulb, sliced very thin then cut though a couple times. I start by mixing the juice of one lime, 5 tablespoons of fish sauce and 1.5 to 2 tablespoons of brown sugar in a bowl to let the sugar dissolve and then move on to prepping the cilantro and shallot. BTW, technique, a mandolin (“V”) slicer set on it thinnest setting is perfect for the shallots. After sliced thin, just run your knife through it a couple times and it’s good. With the cilantro, you want it chopped as fine as you can get it, but don’t make a paste out of it. Once the sugar has dissolved taste the mixture. It should be sweet, salty and sour. If you haven’t had this sauce before, I don’t know how to guide you. If you have, adjust sugar, fish sauce and lime juice as you like it. Next, add the cilantro, shallots, black pepper and 1 or 2 tablespoons of red pepper flake (I use 2 and it’s still not that spicy). I also use regular old Italian style red pepper flakes but any coarse ground red pepper should work though I wouldn’t use cayenne, I think that would be way too hot. For this amount, I would probably serve half at a time. Just before serving (half), stir in half the the toasted rice powder and mix thoroughly. Once the rice is in the clock is ticking. You have at least an hour, but at some point after that, the rice powder will get saturated and soggy and no longer good eats. Thus the serving it in portions and adding the rice at the last moment. Serve with sticky rice and any grilled meat like moo yang. OK, let’s talk fish sauce. First off brands. I use Tiparos pretty much exclusively. If you cook much Thai or Vietnamese food you will know there are many, many types of fish sauce out there. I have not tried them all. 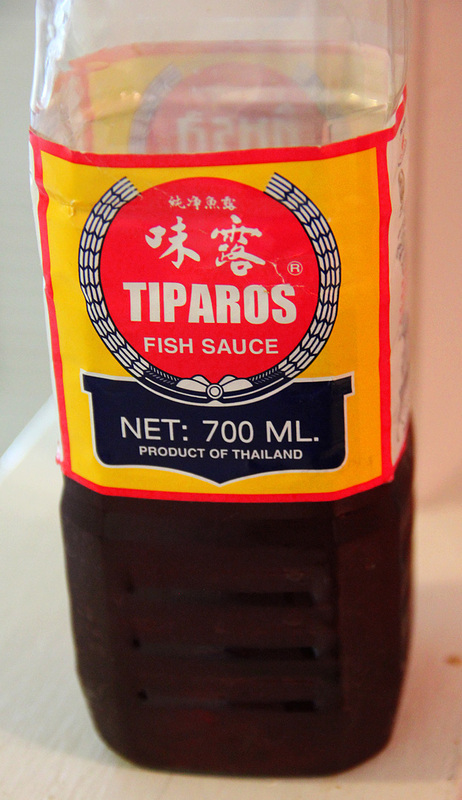 In Thailand, Tiparos brand is ubiquitous in use to an extent much greater than say Heinz Ketchup here in the States. I only remember ever seeing two other brands in people’s actual kitchens in Thailand–Squid brand and the one with the scales on the label (cannot remember the name). And I saw the Squid brand only once (and no, there is no squid in Squid brand fish sauce). I think if you are cooking with a fish sauce it doesn’t matter as much which brand you use. Once in pinch, I bought a bottle of Oyster Nampla fish sauce (and no, there are no oysters in Oyster brand fish sauce) and discovered it’s the worst fish sauce ever–but I still used it for cooking for a week or two until I bought some Tiparos. But this recipe is using fish sauce raw. It’s the base flavor. I would not have used Oyster brand or any other “not-so-good” fish sauce in a raw fish sauce dish. The same would apply to “prik nam pla” (fish sauce with sliced mouse poop chilies). Raw fish sauce needs to be good quality fish sauce. Different fish sauces also have different salinity. Squid brand is a good quality fish sauce, but is noticeably saltier than Tiparos. So if you were to make this with Squid brand, you would need to use less of it. Of course it won’t stay fresh in your refrigerator forever. It will easily keep 3-4 months, probably longer. You can tell the status of your fish sauce by holding it up to a light and looking through. It should be iced tea colored. Not Coke color or (oh, gawd no) coffee color. Make sure you check the bottle before buying them too–and check the expiration dates. All Thai food products will have made and expiration dates on them. Again, since this is a raw fish sauce dish, I recommend using a bottle opened less than a month or just go buy a fresh bottle before making it. I’ve been making this one for years, even before I moved to Thailand–though they loved them there. 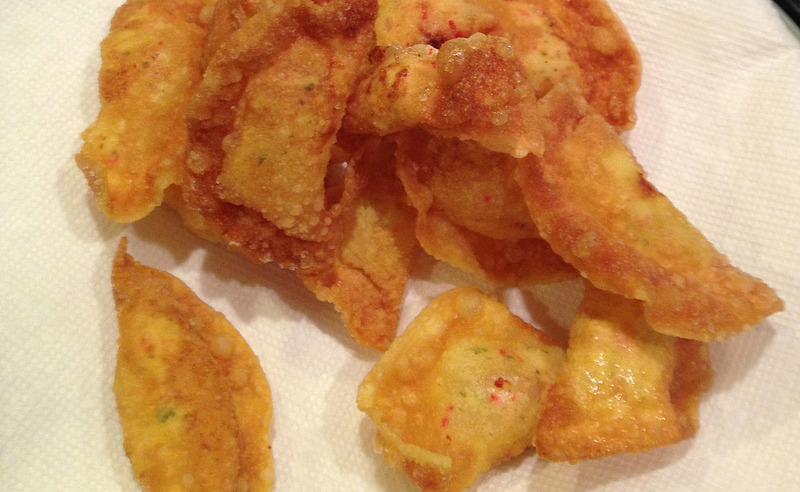 Thais thought putting cheese in a fried wonton was weird–until they tasted them. It was far and away the most requested dish to make by my Thai friends. 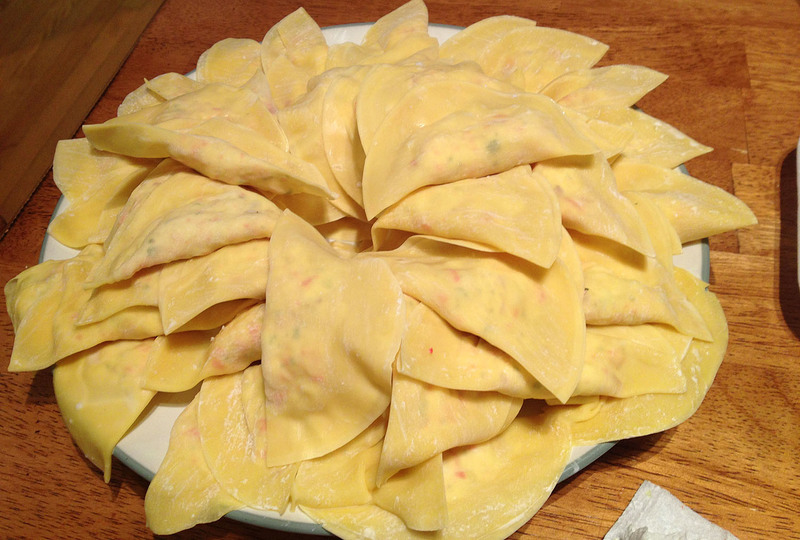 Mix all ingredients except wonton wrappers and vegetable oil. Taste and adjust for seasoning. 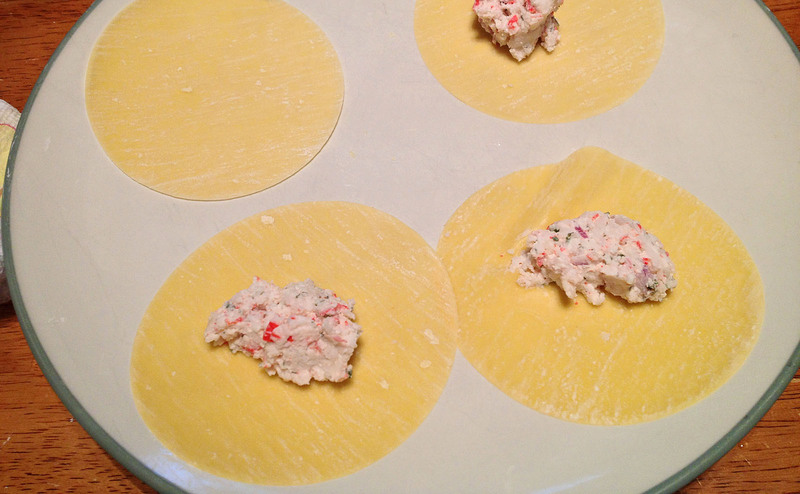 Next, place a small portion in the center of a wonton wrapper. Have a bowl of water nearby. 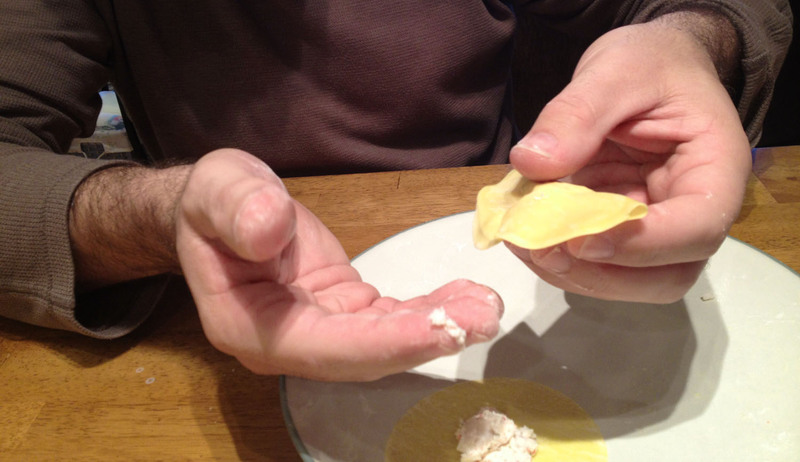 Dip your finger and wet the entire outside edge of wonton. Fold over and work out as much air from inside while pressing together. Fry at 375 degrees until brown. Everything in there is already cooked, so just get the color right and you’re done. Drain on paper towels and serve with duck sauce/plum sauce/Thai chicken dipping sauce–any thing you’d use for a spring roll or fried wonton. This is indeed another kitchen shortcut, but I kinda like those. You could make your own creamed spinach, but this is really a way to add another dish to your table without taking a lot of effort. 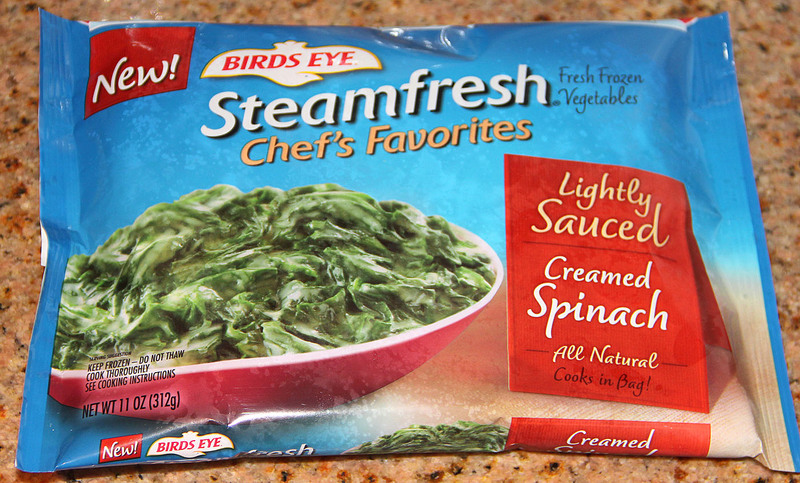 Microwave the spinach packets as directed but don’t cook them the full time. 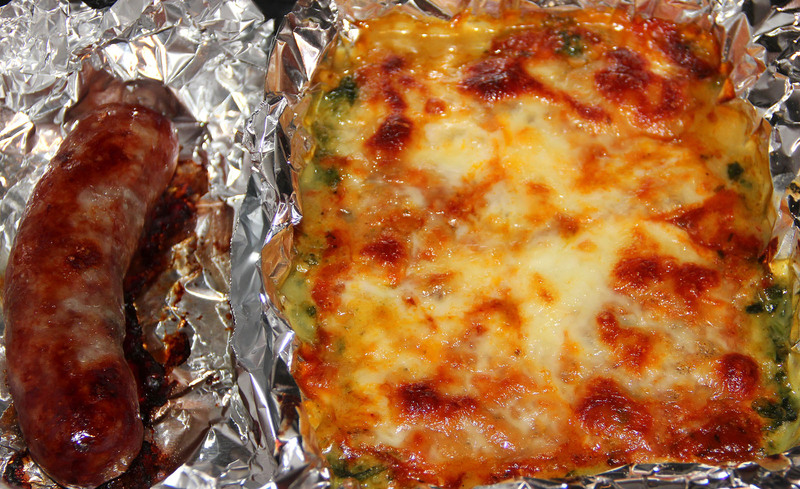 Make sure the spinach is just hot. Probably shave 30 seconds to 1 minute off the cooking time of one bag. Then pour the spinach into a large sieve and allow to drain for 10 minutes or it looks like it’s not going to give up any more liquid. 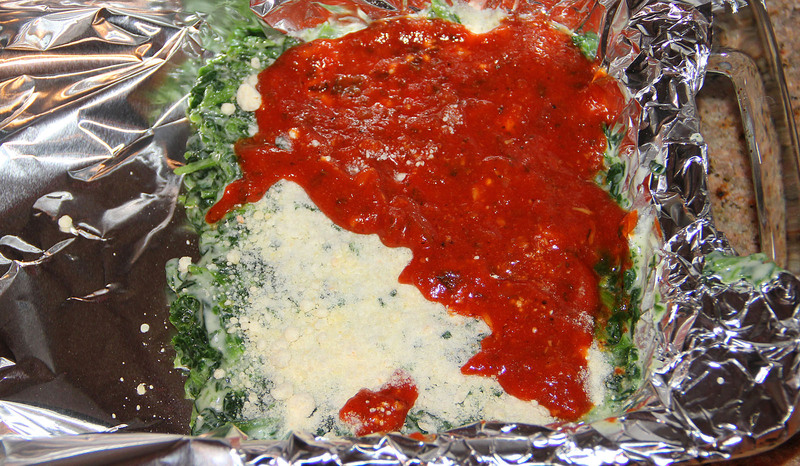 Transfer the spinach to a baking dish. Mix in 2 tablespoons of Parmesan cheese, nutmeg and black pepper then smooth/level out. Sprinkle the remaining Parmesan cheese on top. Add a layer of tomato sauce. 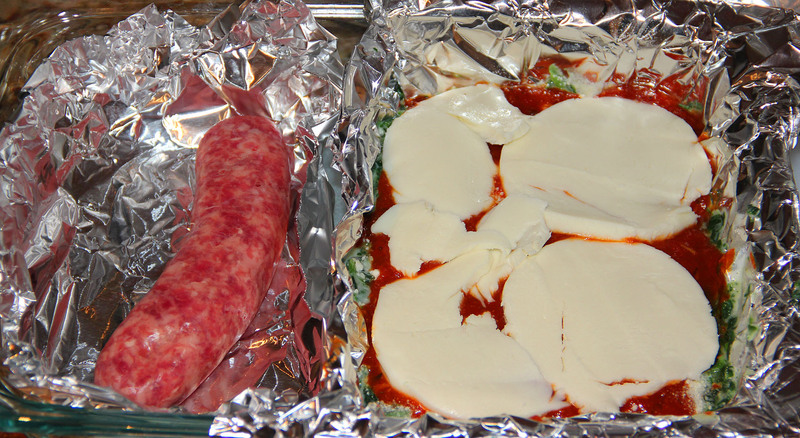 Cover with the slices of mozzarella and bake in a 400 degree oven until hot and bubbly. Let sit for a few minutes before serving.